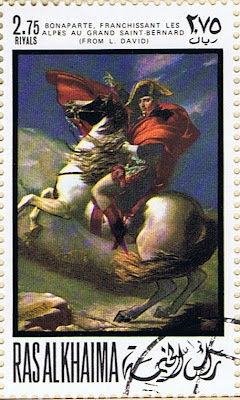 The 75 Dirham stamp is based on the chalk drawing of Napoleon done at his home of Malmaison by Jean-Babtiste Isabey. 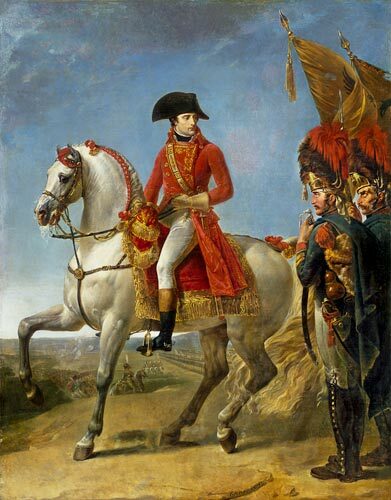 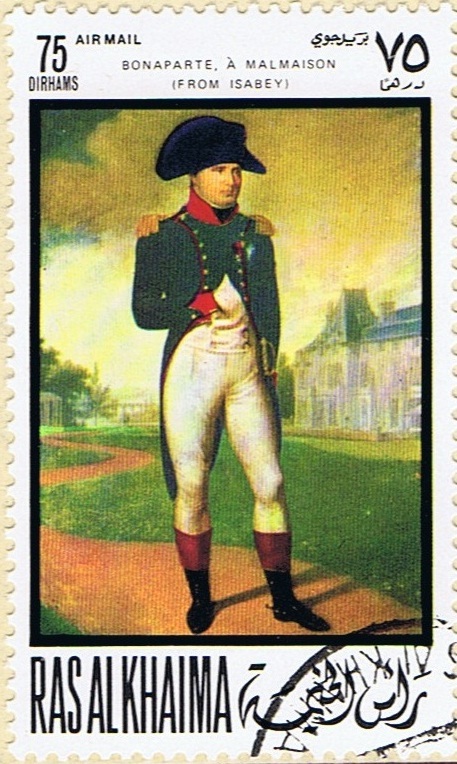 It is the first portrait of Napoleon in undress uniform as First Consul of France. The original drawing was completed in 1801. 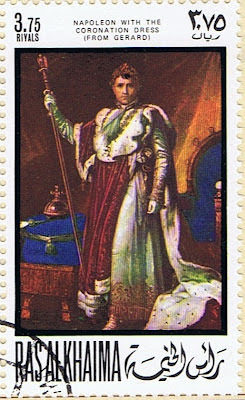 The 1.75 Riyal value depicts the painting done by Antoine-Jean Gros in 1803 of Napoleon distributing Swords of Honour to Grenadiers. 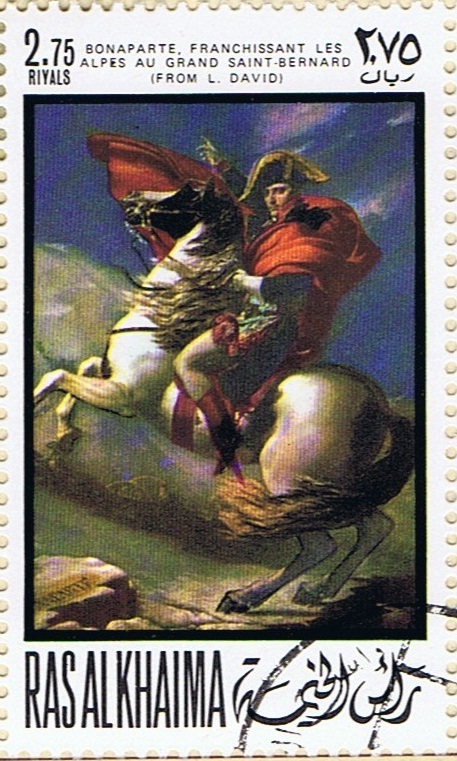 The 2.75 Riyal stamp features Jacques-Louis David’s portrait of Napoleon crossing the St. Bernard. 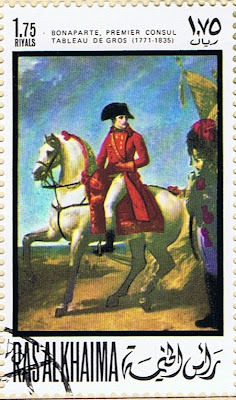 David painted 5 versions of this painting between 1801 and 1805, and I am guessing that the version on the stamp is based on the 5th version. The last stamp in this set features Francois Gerard’s “Napoleon in Coronation Robes” painted around 1804. 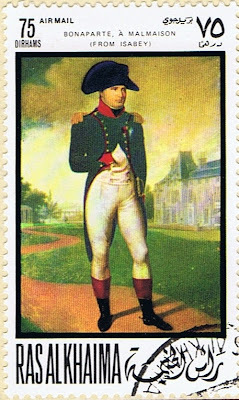 As I don’t currently have a Michel catalogue details of the stamps are nil as they aren’t listed in my Scott or Gibbons catalogues.